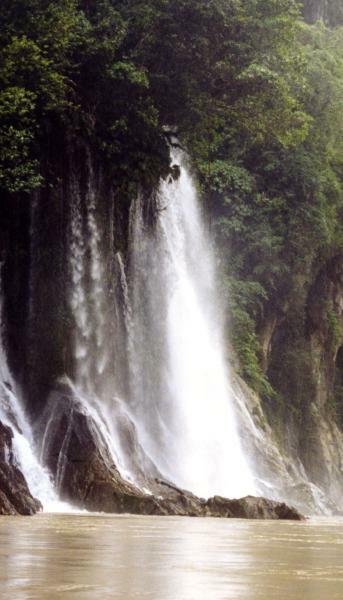 Tonkini Waterfall in the Pongo de Mainique Peru. Expedition Photography. Tonkini Waterfall Pongo de Mainique Canyon, Peru. Cusco through the Sacred Valley of the Incas. Quillabamba to Kiteni and Tintinienkato. On the Urubamba River to the Pongo de Mainique and Timpia. Timpia: "Center for Machiguenga Indian Studies". The Sabeti macaw Clay Lick. Timpia to Sepahua and Pucallpa. Index Page of the Pongo 1998 Adventure.